Our clients are active participants in their health and wellness; stewards and guardians who seek to protect themselves and their family's health. They are people who value healthy natural alternative medicines. When it comes to what they take into their body, only the best will do. Our clients won’t settle for essential oils containing toxins, pesticides, adulterants, or impurities. They use only essential oils that meet the highest criteria, that are verified organic and wildcrafted. You could say they have a nose for quality. We, like our clients, are passionate about seeking out the very best — that’s why there are never any exceptions to our 100% certified organic and wildcrafted standard. We know all our hand-picked farmers, distillers, and suppliers worldwide and verify the purity of their certified organic and wildcrafted products with eight different quality tests performed by a Certified Clinical Aromatherapist. We know that a cleaner, healthier plant (one that has never been sprayed with toxic pesticides) produces a cleaner, healthier essential oil. Only an oil which has been produced from a plant untouched by toxic pesticides can be certified organic. Every oil made from organically grown plants will have the USDA organic seal. If the seal isn’t there, it isn’t organic; regardless of what may be advertised. The top two grades of essential oils are USDA certified organic and wildcrafted*, these are the only grades Purify Skin Therapy carries. *”Wildcrafted” is when the plant spontaneously grows and thrives in its natural habitat. No one sprays these plants, and they are harvested ethically and sustainably. Like most things in life, you get what you pay for. Avoid jeopardizing your health with cheaper oils that are not grown organically and contaminated with pesticides. When you choose Purify Skin Therapy’s organic and wildcrafted essential oils you are protecting your family from the toxins that lurk in the conventionally produced non organic essential oils. USDA certified organic & wildcrafted Premium Therapeutic Grade essential oils by Purify Skin Therapy are the purest, cleanest, most therapeutic essential oils available. Because of this our oils are more potent, work better in your body, and there is no risk of them containing toxic pesticide residue. You use less and get far better results. These are not cheap oils you use to clean your house, these are the oils you want to use on and in your body, and with your family. We know we could never make anything better than Mother Nature, so we ensure nothing gets in Her way. You are guaranteed we maintain these high standards with each and every one of our organic oils proudly boasting our Purify label and the USDA certified organic seal. To get the full benefit of natural essential oils and aromatherapy, you have to know where to buy essential oils. The best essential oil companies will sell USDA certified organic and wildcrafted essential oils to ensure the purity, safety and effectiveness of their products. Here at Purify Skin Therapy we are so committed to the higher quality and effectiveness of pure organic and wildcrafted essential oils, that's ALL we carry! Purify Skin Therapy only sells 100% pure, authentic, natural, unadulterated, unaltered essential oils. A few of our essential oils are really thick, like myrrh, sandalwood, and vetiver. These oils should be naturally thicker, and we don't dilute or extend our oils in any way, so they come very thick in the bottle. These essential oils are as pure as it gets! Straight from Mother Nature to you. You will notice these oils are potent and intensely clear. A little goes a long way. Because the phytochemicals in essential oils can be up to 100 times more concentrated than the phytochemicals in the plant they came from, it is crucial that the essential oils are completely toxin free. The only way you can know for sure is to see the USDA Certified Organic seal on the label of the essential oil. Did you know USDA Certified Organic offers you so much more than just being toxic chemical free? It does guarantee you toxic chemical biocides have never been sprayed on the plant = cleaner healthier plants produce cleaner healthier essential oils. It also guarantees you purity. Plants that have not been sprayed produce cleaner, healthier, toxic chemical free essential oils. It also guarantees you higher vibrational properties in the oil. Plants that have not been sprayed with chemical toxins have higher vibrational qualities than plants that have been sprayed. When you buy Certified Organic products you are doing your part in reducing the amounts of pesticides, insecticides, larvicides, sewage sludge, and other toxic biocides used to pollute our planet and Mother Earth. You are also supporting our ecosystem and taking a stand against poisoning the wildlife, insects, frogs, birds, bees, worms, and other soil organisms who play their part in the delicate balance of our ecosystem. Every essential oil and carrier oil listed as certified organic on our website started from non-GMO seeds, has been grown, harvested, distilled, and handled without the use of toxic pesticides, insecticides, larvicides, biocides, artificial chemical fertilizers, toxic chemicals, sewage sludge (aka biosolids), other harmful chemicals, and irradiation according to the USDA NOP standards and is USDA certified organic. Seeing the USDA certified organic seal on the product is your guarantee that the oil in the bottle is clean and that it really complies with all these organic standards. If you think about it, this is the quality EVERY essential oil company wants you to THINK they have. But all you have is their word. Will you believe them? If you want to be GUARANTEED this quality in your essential oils then look for the USDA Certified Organic seal right on the label. Then you know for sure you're getting the quality you think you are. How can one tell if an essential oil is organic or not? Look right on the label for the USDA certified organic symbol. Now that you see using certified organic oils is so important, you want to make sure you are using certified organic oils. Many essential oil companies claim to have organic oils, but to prove our commitment to you as our clients to provide only the cleanest oils we went through the process to get our oils USDA certified organic. We are inspected by a third company (OTCO) who verifies that our essential oils really are USDA certified organic. It is that important to us that you know you're getting only the best quality from us. Purify Skin Therapy is your trusted source of superior grade USDA certified organic essential oils. Most (76%) of our essential oils are USDA certified organic, the other 24% are sustainably and ethically wildcrafted, which means they're completely unsprayed, clean, healthy plants that grow in the wild. We believe a cleaner healthier organic plant produces a cleaner healthier essential oil. Warning: companies who promote their essential oils as organic (but not certified), better than organic, or beyond organic but do not have the USDA Certified Organic seal right on the label of the bottle are promoting their non-organic products illegally, trying to convince the consumer that their non-organic essential oils are of the same quality as organic ones. Don't be fooled by these tricky, confusing, and illegal marketing methods. Support Purify Skin Therapy! We are dedicated to source the highest quality Certified Organic essential oils and we're doing it legally and ethically so we can deliver a better quality product to you. Don't be fooled by fancy and distracting marketing tactics. Buy USDA Certified Organic essential oils with the USDA Certified Organic seal right on the label for higher quality essential oils. Did you know to be USDA Certified Organic a plant MUST be NON-GMO? 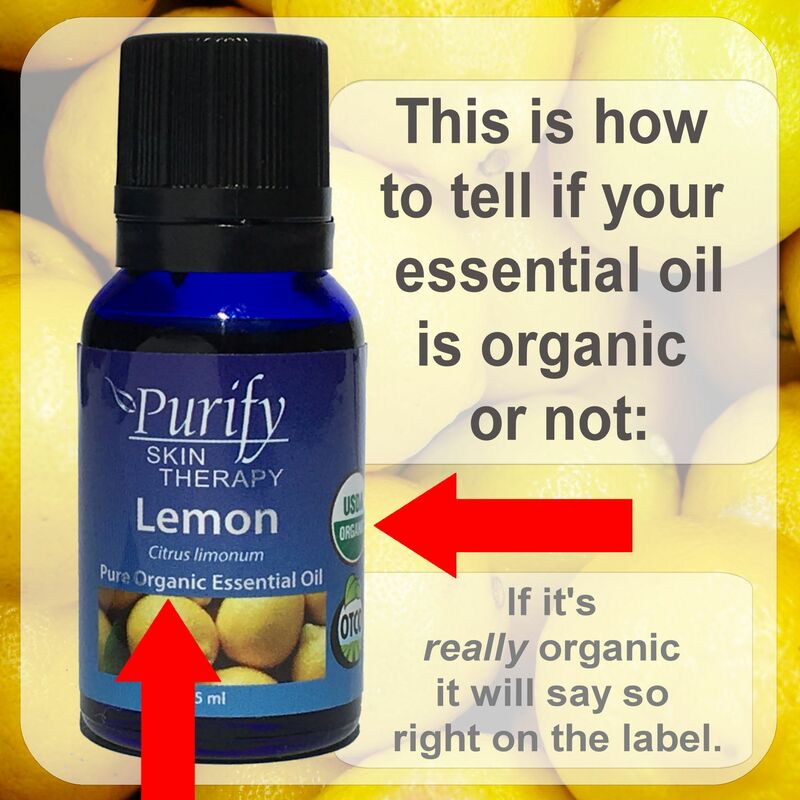 So if you see the USDA Certified Organic seal on the label of the bottle, you are guaranteed by the USDA that the essential oil inside is not a GMO. When you buy certified organic essential oils you are assured that they come from NON-GMO plants. Did you know ⅓ of our crops in America are now genetically modified!?! Organically grown produce cannot be genetically modified in any way. Choosing organically grown produce (and essential oils) guarantees you that foods (and essential oils) have not been genetically engineered or modified. Being GMO-FREE is certainly important because when you're using plants and essential oil in your home remedies, you do not want genetically modified plant products. They just don't act the same in the human body. These are the ONLY two grades of essential oils Purify Skin Therapy carries. You are guaranteed superior quality with all our USDA Certified Organic and Wildcrafted essential oils. Purify Skin Therapy is the only company to offer you only USDA Certified Organic & Wildcrafted essential oils. Our commitment to quality runs deep, and we don't carry any conventionally grown essential oils that have been sprayed with toxic chemicals. All the oils we carry are superior quality. Try them and you too will see the difference. Purify Skin Therapy's essential oils have undergone our extensive quality and purity tests and are 100% premium therapeutic grade. We have many clients who have commented on how potent and fresh smelling these oils are, and how these oils work for them when other brands of essential oils did not. Purify Skin Therapy started with the goal to carry only the highest quality certified organic & wildcrafted essential oils. We source our oils from all over the planet, wherever the plant grows with the best constituents. We have cultivated relationships with the farmers and growers of small artisan farms whose passion for quality and dedication to organic standards is matched only by our own. Most of our certified organic essential oils are sourced from outside of the USA. We have developed relationships with farms, small distillers, and certified suppliers around the globe who are dedicated to producing clean, sustainable, organic products. We work with them to bring you the highest quality USDA certified organic and wildcrafted essential oils. Purify Skin Therapy is your source for superior quality pristine organic essential oils. Purify Skin Therapy is a company founded by Holly Draper, Certified Clinical Aromatherapist and Internationally Registered Aromatherapist. She also sources all of the essential oils for Purify Skin Therapy to bring you only the highest quality essential oils. She has dedicated her life to the study of holistic aromatherapy and the correct and safe use of essential oils. She is passionate about using only the best quality essential oils (because they work better) and using them safely. No company brings you the education and passion about superior essential oils than our Certified Clinical Aromatherapist. All of our oils are GC/MS tested, and more importantly, the GC/MS tests are read by our Certified Clinical Aromatherapist, who has been trained to distinguish the good oils from the not so good ones. Our oils go through several tests to ensure you are getting the best essential oils possible. These are superior quality essential oils, and we believe with one smell you too will see the difference! We hand make our blends from our pristine USDA Certified Organic & Wildcrafted essential oils we sell as singles. We don't use cheaper oils in our blends which is common practice in the industry. We also make our blends in small batches and bottle them by hand. We are one of the few companies that hand bottles our essential oils. We hand bottle our oils to prevent the cross contamination of machine bottling. This is another assurance that our oils are completely pure and there is no chance of accidental cross contamination from machine bottling. Cobalt blue glass bottles cost three times more than amber brown bottles, but when you have the highest quality essential oils you want to protect them to the very last drop. Blue glass better protects your volatile essential oils from light so your oils will last longer. We do not skimp on the packaging, so these pristine essential oils will last longer. Purify Skin Therapy was the first essential oil company to bring you a line of KIDS safe and BABY safe essential oils formulated specifically for your little ones. Our Certified Clinical Aromatherapist has four kids of her own and she took the worry out of using essential oils safely on your kids with her line of KIDS safe and BABY safe essential oils. LEARN MORE.